One of the best parts about working at 23andMe is being surrounded by people who are active and love taking on new challenges. We exercise together regularly and are always looking for new ways to contribute to our community, so we recently decided it was time to take on our first race. We chose the LIVESTRONG Challenge in San Jose on July 13th — a combination of 100, 65, 50, and 10 mile bike races, a 5k run, and numerous volunteer opportunities — because it would give our diverse group a chance to be active at all different levels while raising money for a good cause. What we didn’t know when we began this challenge was how much of an impact this race would have on all of us. Team 23andMe consisted of eight riders, seven runners and seven volunteers. Together, we raised close to $2,000 for the Lance Armstrong Foundation (LAF), which helps serve the 12 million Americans fighting against cancer. Lance Armstrong founded LAF after he was diagnosed with testicular cancer at the age of 25, in order to help others who were going through the same struggle. In the past ten years, LAF has raised more than $250 million for research, increased awareness of cancer and empowered survivors throughout the country. Excitement filled the air Sunday morning as Lance stood on the podium to address the racers and explain why we were crazy enough to get up at 6am on a Sunday morning to put our bodies through pain. We were there to help those suffering from cancer and to honor those who succumbed to their illness. He reminded us that although we were amongst many survivors, an even greater number had not won their battle. In fact, more than 550,000 people will die this year alone from various forms of cancer. Lance was there to motivate us to run faster and ride stronger — and it was working. At a typical race start, I put on my iPod and bounce around eager for the gun to go off, but the LIVESTRONG Challenge was different. Waiting for the start, I looked around and saw that nearly everyone had a special bib pinned to his or her jersey honoring someone who had been affected by cancer. It was emotional and inspiring. Then I saw the faces of the children, some as young as three years old, who were currently undergoing cancer treatment and being carried in pedicabs so they could participate in the race. At that point, I lost it. It was no longer about setting a personal record or witnessing one of sport’s greatest legends, it was about picking a fight with cancer. It was about helping those who had suffered, who are suffering, and who will suffer from this brutal illness. Each member of Team 23andMe had his or her own personal motivation going into the race. Each one of us gave it everything we had (I could really tell we’d all given it everything we had when no one wanted to walk around looking for free stuff at the post-race party). A big congratulations to Oliver Ryan, our Director of People, who finished 4th in the 50 mile bike race. And Brian Naughton, one of our Founding R&D Architects, finished 17th overall in the 5k! I set a new personal record. I guess having motivation beyond just racing can push you farther and faster than you knew possible. After a few pats on the back, a hot shower, a good meal and some cold beer, several of us jumped back out on the race course to volunteer, running yellow roses (LAF’s signature color) to cancer survivors who crossed the finish line. We shed a few tears and cheered our way through the sticky afternoon while riders of all sizes and shapes came racing through the finish line to earn their yellow rose and my deepest respect. After watching survivors finish strong after riding 100 miles through the South Bay summer heat, I realized it really is all about the fight. 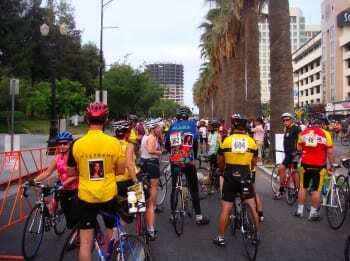 The LIVESTRONG Challenge was a spectacular event and I can’t wait for next year. I have never been so proud to be part of such a special company, with people who can see beyond themselves and want to help those in greater need. We united on Sunday to pick a fight against cancer and I think we’re on our way to winning.